Tommy Deas, Joey Chandler, Molly Catherine Wash, Drew Taylor and Drew Hill of the Tuscaloosa News won first place in the Associated Press Sports Editors 2017 contest in the Projects category for the Under 30,000 circulation division. The winner in each category will receive a plaque at the 2018 APSE Summer Conference in Nashville. 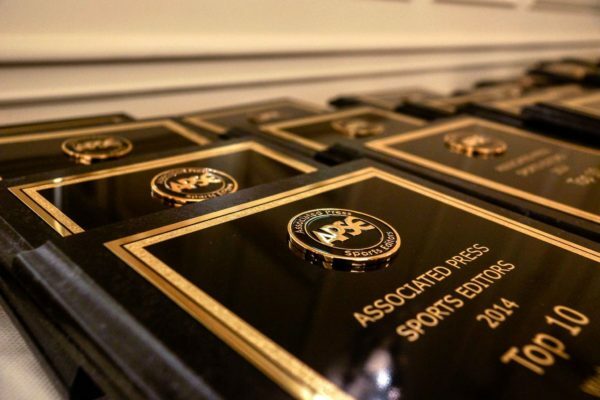 The banquet and awards dinner will conclude the APSE Summer Conference, which takes place June 17-20 at at the Marriott Hotel Nashville / Vanderbilt University. Brian Mull and Dan Spears of the Wilmington StarNews placed second. Brad Tollefson, Carlos Silva, Nicholas Talbot, Bryan Navarette and Mike Graham of the Lubbock Avalanche-Journal finished third. Sports editors in the Under 30,000 category submitted 14 Project entries. The contest is open to APSE members. Click here to join. In February, preliminary judges at the APSE Winter Conference in St. Petersburg, Fla., and off-site around the country, selected a top 10, with each judge ranking the entries in order from 1 to 10 separately on a secret ballot. Entries were given 10 points for a first-­place vote, nine points for second and so on down to one point for a 10th­-place vote. The final 10 were given to a second judging group, which ranked the entries 1-­10 in the same fashion. The winner and final rankings are determined by tallying the ballots. The Projects category judges a Collection of articles that sheds new light on personalities and issues in the news, including trends and original ideas. The top 10 is listed below, with links to writers’ Twitter pages, APSE member websites and winning entries.